The ultimate simple dessert. Not every occasion calls for a triple decker German chocolate cake or rich decadent Paula Deen-esque work of sweet buttah. No, today we’re celebrating simplicity. 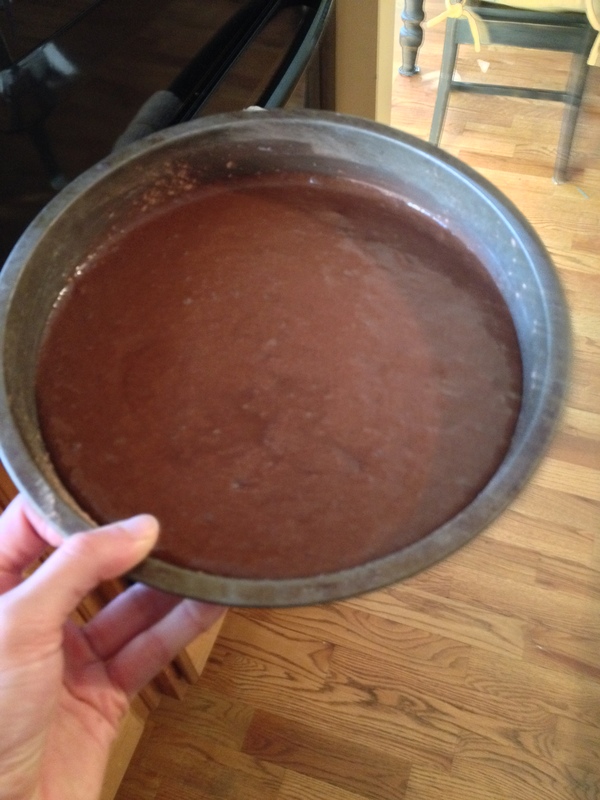 A flick of your magic cooking wand and a swish of the spatula, and bibidi-bobodi-boo, a one layer chocolate cake. I made this for a special dinner with my cousins and aunt and uncle, and let’s be real, the dessert I brought was a reflection of how I felt at the time. I had buttermilk on hand and could have made the amazing buttermilk skillet cake that you saw a few months ago with the praline topping. But I felt that kind of happiness that required no cherry on top to commemorate a celebration. 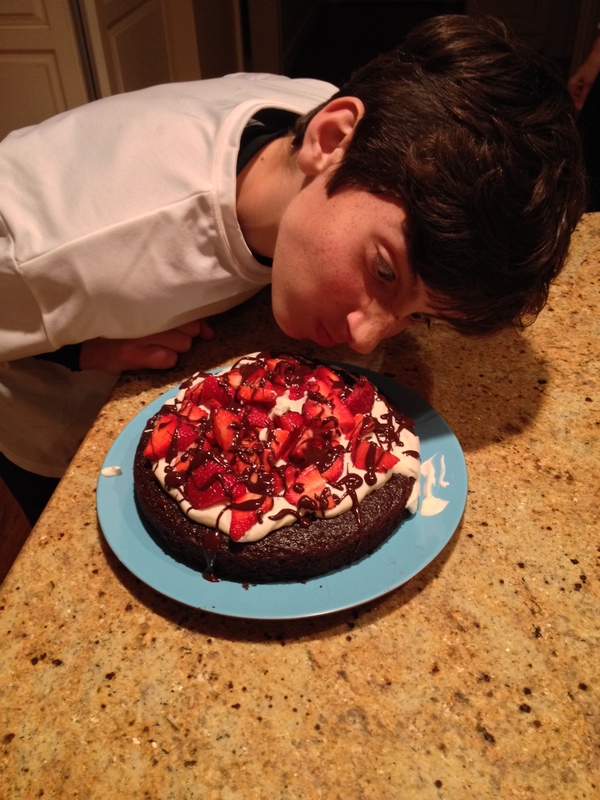 I wanted to look at vibrant natural colors (enter: sliced strawberries), hang out with my cousin (assembling the cake at the dinner), and feel satisfied not stuffed after the meal (one layer not two layer cake). Made a good choice! 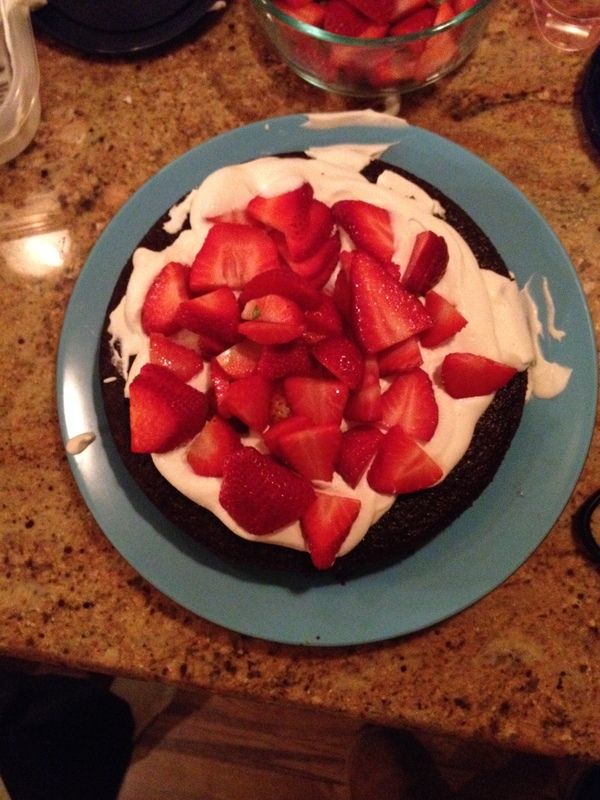 Here we have a half recipe of Ina Garten’s Beatty’s Chocolate Cake topped with my favorite whipped cream concoction, sliced strawberries, and my fave chocolate ganache. I am a total fanatic for chocolate cakes with coffee in them as it always adds richness without too much sweet. 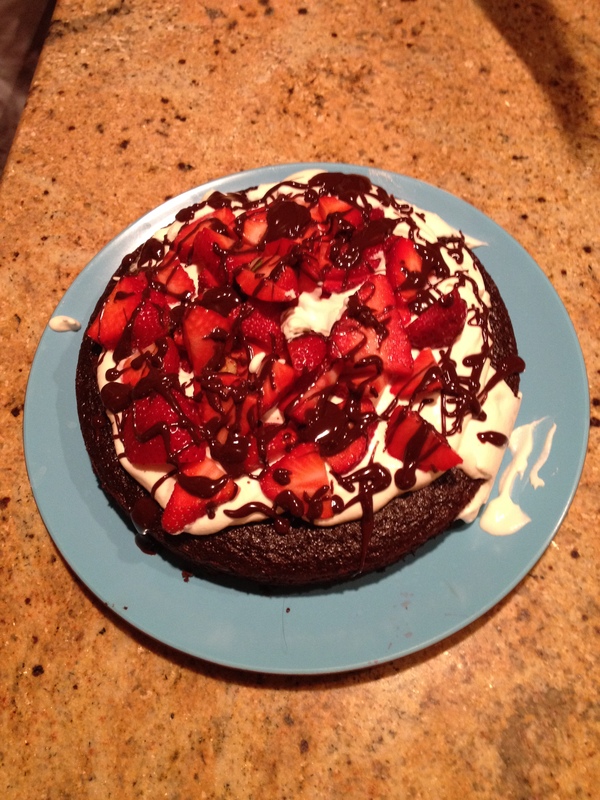 Ok so the strategy for simple dinner-at-family’s-house cake goes as follows…start with your simple chocolate cake. 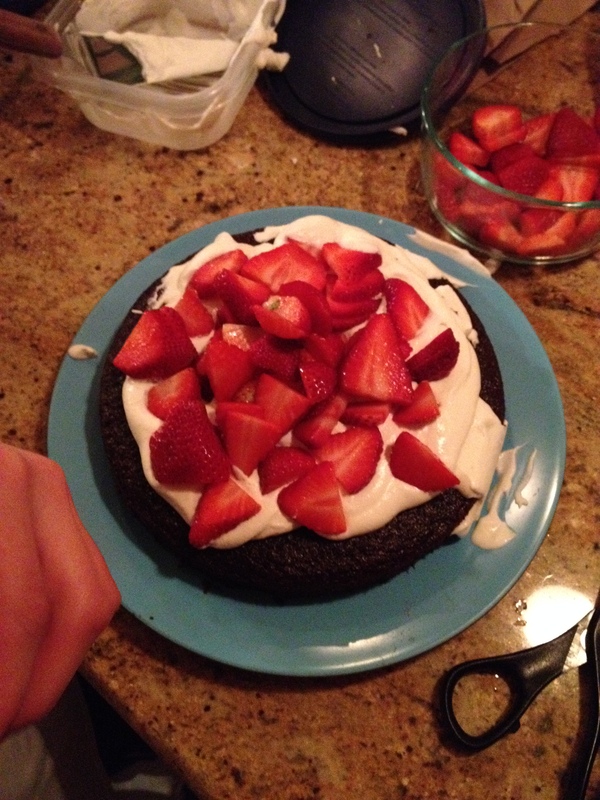 Use half of Ina’s, like me, or just make a devil’s food cake from a box and it’ll get all fancy with the toppings! The timing is favorable. You have time to clean up all that chocolate mess, lick the spoon and wait for the cake to come out until you prep the toppings. 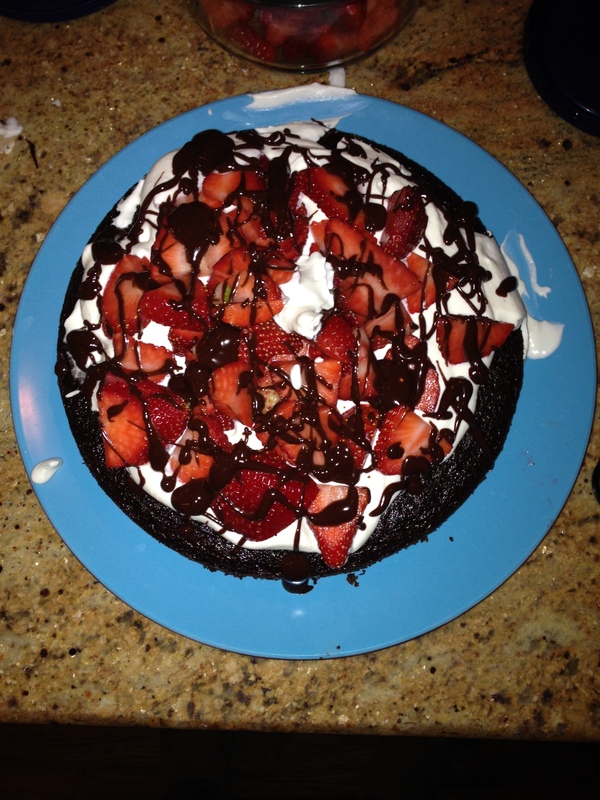 If I were you, I’d just go ahead and get the ganache out of the way, sometimes it can be messy. So let’s melt some chocolate drizzle. Chop up 4 oz whatever bar chocolate you’ve got on hand (I had some bittersweet chips and a dark chocolate bar) and place in a heatproof bowl. Meanwhile warm 1/2 cup heavy cream in a sauce pan until bubbles start to form all around the edges (the cream is simmering) and pour half of it over the chopped chocolate. Let the chocolate melt for about 30 seconds then start to stir together. After it’s partly smooth add in the rest of the cream and stir until smooth. 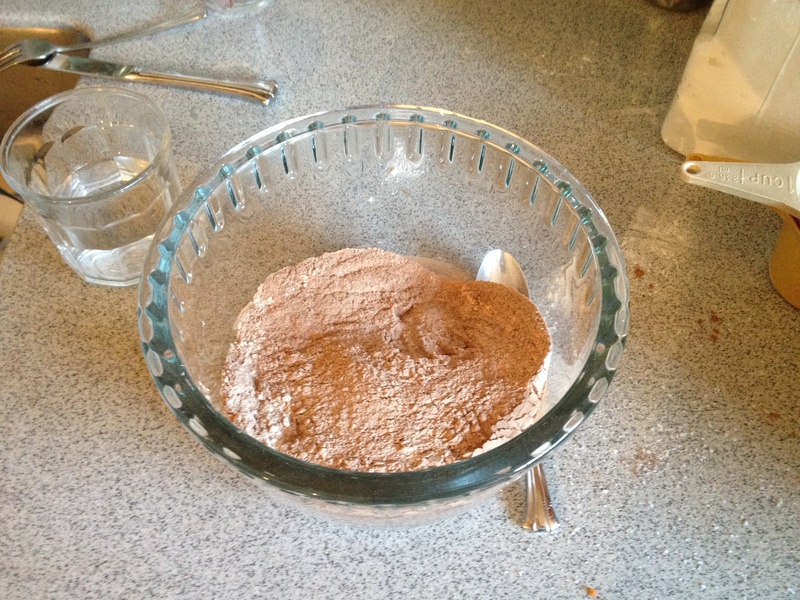 Set aside to cool and transfer to a small container. 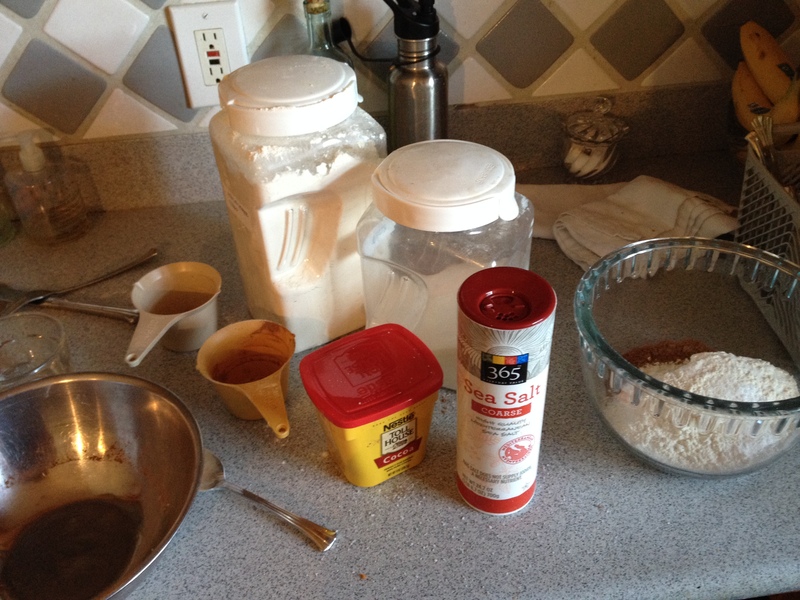 Is your cake sitting invitingly on your counter now? Time to assemble the rest and get ready to go. Whip up some of your favorite whipped cream and slice up the strawberries. Store each separately in containers. Flip your cake (fingers crossed, seamlessly) onto a plate and cover with aluminum foil. 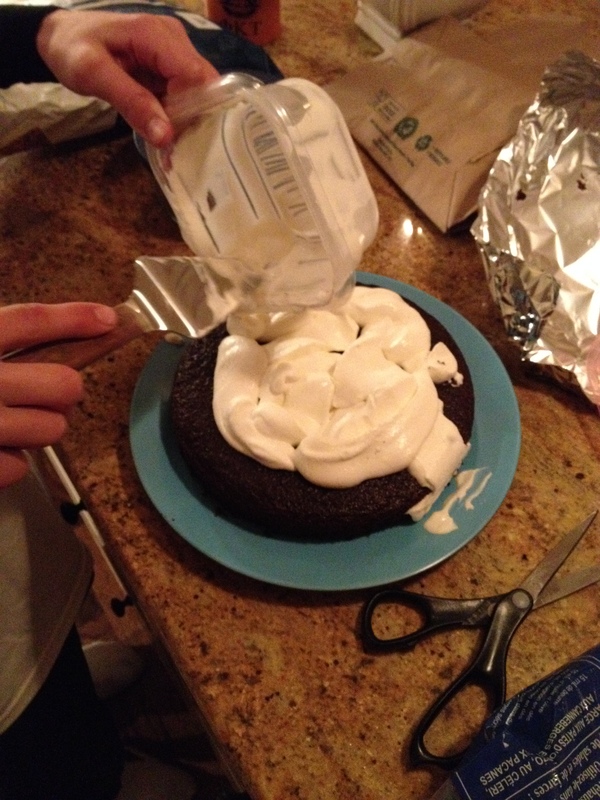 At your friend’s house, store the whipped cream in the fridge and let your cake continue to cool. You don’t want to top the cake with the whipped cream and have it melt! When dessert time rolls around, ask your cousin to help you assemble, topping it with as much whipped cream, strawberries and ganache drizzle as you like. There’s no way to have too much or too little of either. Well, there’s always a way to have too little chocolate. Can’t wait to try this with raspberries and maybe slivered almonds. It’d also be great to add a little kahlua to the whipped cream or dark rum! Bon appetit, chocolatiers. Tell me how it goes! I’m lucky to have been one of the diners to enjoy this delicious (and beautiful) cake!